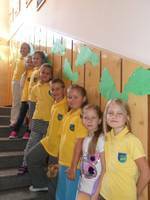 Children from the Szkoła Podstawowa nr 4 in Elk already participated several times. We live in the part of Poland which is so called Masurian Lake District. This year the area was on the list in a contest for Seven New Wonders of the World. In our school Wladyslaw Szafer’s Primary School No 4 in Elk we decided to join two activities together and encourage our students and their families to participate in the voting. First of all, we had announced some activities which involved our pupils and their parents. 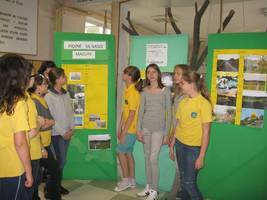 There were: drawing , writing and photo contests. The topic of all works - “Mazury jak wy cudne” (the Beauty of Masurian Region) - reminded about the voting. We also asked our pupils to invite their parents to go for eco-friendly trips and do drawings and photos in the countryside. The idea was to remind adults that we live in a very beautiful area and we should appreciate the beauty and be in contact with nature as much as possible. This way parents and pupils could enjoy having fun together, breathe fresh air and develop the right attitude to the environment. After the weekend we counted the amount of the trips and wrote it on the green footprints. Every class counted it in its own and made its footprints .